Where were you 48 years ago today? If you happened to be passing by 105 Second Avenue in New York City’s East Village, you would likely have seen a fantastic group of names displayed on the marquee at Bill Graham’s Fillmore East. On Friday and Saturday, April 26 and 27, 1968, Iron Butterfly shared an explosive bill with Traffic and Blue Cheer. The Fillmore East itself is now just a memory, of course. Its exterior and entrance now welcomes you to a bank, and the storied auditorium has been demolished. But the music recorded at the venue lives on. Artists as diverse as The Allman Brothers Band, Laura Nyro, Miles Davis and The Mothers of Invention have all released live albums from the Fillmore East. Recently, Rhino Handmade unveiled another live set from the legendary New York spot with Iron Butterfly’s Fillmore East 1968 (RHM2 526745, 2011). The new release is culled from the band’s four sets on those two April evenings, three of which are presented in full. (The Friday late show is incomplete due to tapes of two songs being unusable.) “A gentleman by the name of Jimi Hendrix will be joining us on Friday night” is the first thing you hear from the Fillmore’s announcer before he introduces Iron Butterfly to the eerie strains of an organ. We’ll hear variations on this pre-show announcement more than once over these two discs; there’s a definite feeling of déjà vu as the band runs through a tight set four times with some variations in each set. 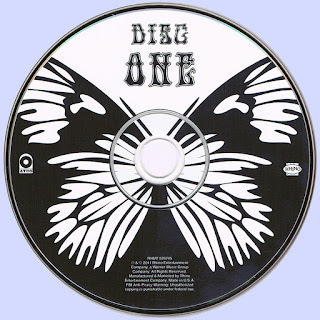 The sets focus mainly on material from Iron Butterfly’s first album Heavy, and predate the official commercial release of the band’s most famous song, the sprawling “In-A-Gadda-Da-Vida.” In fact, it hadn’t been recorded yet at the time of these concerts, so there’s no recognition applause for the song. One wonders, what did the audiences make of the epic song, hearing it for the first time? Two versions of it are on Fillmore East, the band having saved it for the late shows. One workout runs 17 minutes, similar to the running time of the studio original; the other take is a comparatively brisk 15 minutes! Still perhaps the the apotheosis of psychedelic hard-rock excess, “In-A-Gadda” is introduced in the late Saturday set with “This is called ‘In Our Gadda Da Vida…which doesn’t mean a damn thing!” In addition to the title track, two more songs were previewed from the In-A-Gadda-Da-Vida album (“My Mirage,” “Are You Happy”). “Her Favorite Style,” played at Saturday’s late show, wouldn’t arrive on vinyl until 1969’s Ball. Iron Butterfly can boast one of the most frequently altered line-ups in rock history, with over 50 line-ups having played under the band’s name over the years. Three of the group’s original five members departed after studio debut Heavy, so Fillmore East offers a chance to hear new members Lee Dorman (bass) and Erik Brann (guitar) joining Doug Ingle (organ/lead vocals) and Ron Bushy (drums) on songs from that album. Though they hadn’t been playing together for very long, these four members were attuned to each other intimately. This album makes for a stronger overall collection than the somewhat-maligned 1970 Live album from this same quartet (on which “In-A-Gadda” took up the entire second side!) recorded over a year later, in May 1969. All of the material on Fillmore East 1968 is entirely self-composed by the band, with no covers in the set. (Allen Toussaint’s “Get Out of My Life, Woman” appeared on Heavy but wasn’t reprised live at the Fillmore.) The band’s acid, proto-metal sound found full expression in a live setting, but there aren’t many improvisational surprises here. In many cases, these renditions are similar to the studio originals, but with more bite and the energy that can only come from a band performing to an appreciative audience at a high-profile venue. 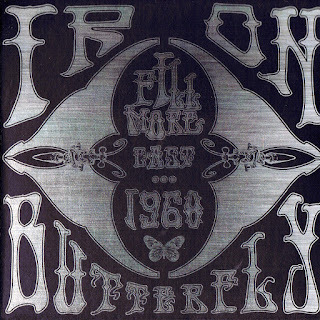 Having toured with other psychedelic rock bands like Jefferson Airplane and the Doors, the members of Iron Butterfly had experience under their belt and played up their role as a kind of sinister answer to the buoyant sounds post-Summer of Love. The lyrics are somewhat less unorthodox on “Stamped Ideas,” which grafts a counterculture sensibility on top of what’s more or less a traditional love song: “You stay away from people made from plastic in a mold/And keep your stamped ideas inside your head untold/Because, I, baby, am protecting you against/The kinds of things that other people do now/I, baby, am protecting you ‘cause I’m in love with you.” The simple lyrics never detract from the heavy backing. Rhino Handmade hasn’t cut any corners on this release, handsomely housed in a sturdy, oversized digipak. As recorded at the Fillmore East by Lee Osborne, sound is stellar for a live recording circa 1968, and in the set’s well-designed booklet, there are a couple pages of notes about the sound and recording technology. Wyn Davis has mixed and mastered the tapes for this set produced by Steve Woolard. David Fricke offers an informative essay placing this album in the band’s chronology. In addition to small photos of the band, there’s a double-page spread of a far-out Fillmore East poster from artist David Byrd (also responsible for the iconic Broadway logos of the original Follies and Godspell). The embryonic sounds of hard rock are sometimes ignored as we look back with rose-colored glasses at late-1960s psychedelia. To recall just how potent a forceful rock quartet could be, look no further than Iron Butterfly’s Fillmore East 1968.